Bhowani Junction (1956) – Raj romance the way it should be! I’ve always been keen on watching foreign films set in India, though I’ve seldom liked them! They’re either too Orientalist or too boring – frequently both. In spite of that, it’s hard to resist the pull of seeing India through an alien lens. 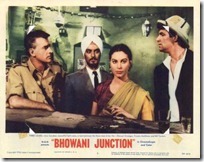 Bhowani Junction was one of the first set-in-India English language films that I ever saw. I’ve compared every subsequent film of this kind against it, and found it wanting! It’s not because Bhowani Junction eschews Orientalism/Colonialism altogether, but because these are kept in fairly good check, and the fast-paced and interesting narrative keeps me too occupied to brood upon the flaws.